FavFotoFriday was inspired by a blogging friend Sandy of Scribbles and Musings . I wrote my first post on this theme last week. So, it’s #FavFotoFriday time again and this week I rummaged through my old Flickr photo albums and decided to make today’s theme all about buildings and architecture. Please don’t yawn! One of my subjects while in 6th Form ( I think that is high school in the US?) in the UK was Art. At 6th Form in the UK, you study specialist subjects for two years for what was at that time called “A” Levels. “A ” meaning Advanced, as opposed to “O” Levels (Ordinary) which you completed at 16 years of age and comprised of all the general subjects such as English (Language and Literature), Maths, Physics/Chemistry, a foreign language or two, Geography, History etcetera. By the time you had completed your “O” Level exams at 16 you were then free to either leave school, hopefully, to gain employment, or continue studying until 18 for your “A” levels. Following completion of your “A” Levels at 18, you then chose to apply for university (a degree course) or leave school to find work. I chose English Literature, French, History and Art to study at “A” Level. Art was really a filler, as I didn’t really have any artistic talent, except when it came to drawing buildings! I loved architecture and developed a basic knowledge of classical styles as well as Norman period church architecture. I got to know my Dorics from my Corinthians and my naves from my precepts! Ask me to draw a human figure or an apple, and I was rubbish! But, the soaring perpendiculars and sensuous swoops and swirls of classical Greek buildings stirred me! All answers on a postcard and mail to me in Bacolod haha! I’m sure most of you will know the answer but in case you don’t, I will reveal the answer in next week’s FavFotoFriday. Okay, so what about my own FavFotoFriday photos? Well, here they are and they are all about architecture. All of my own photographs were taken with my Canon camera and lenses. I like this shot I took because of the perspective. The building in the left foreground appears to dwarf the Petronas Tower. The camera never lies eh? I also like the feathery clouds in the blue sky. This above is a further shot of the towers but from a different location. It truly depicts the soaring magnificence of the structure. This shot above of the Old City Hall, Boston (I think that is what it is!) is a contrast between architectural styles in the same neighborhood. The old and the (relatively) new. It doesn’t take too much imagination to isolate the City Hall from the rest of the picture and see horse-drawn carriages instead of the MPV in the foreground, and erase the high rise buildings dwarfing the older historical building. The above picture is one of my all time favorites that I have shot. I had left early from the church service where my cousin’s son was being married. I did so to prepare my camera and lens to shoot some scenes as the happy couple descended the steps of the church following their union. It was a quiet Saturday morning and peaceful with an absence of serious traffic. I went for a short stroll to await the bride and groom exiting the church. It was a time to reflect on love and marriage. 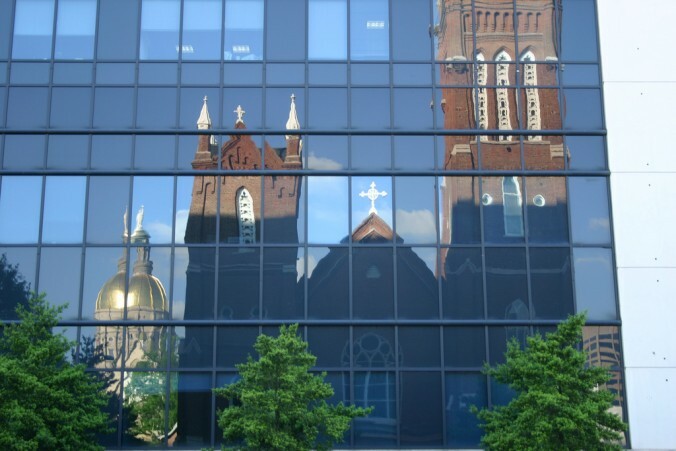 My reflections turned to this reflection in the steel and glass building opposite the church. It captured not only the church and the beautiful clear sky but also another building with a golden dome topped by a cupola and statue. I think it may be a court house? Maybe you Atlanteans can enlighten me? Architecture includes street architecture. Once again shot in Atlanta and a short time after the reflection photo was taken. It not only captures the exact location through the overhanging street sign. It also highlights all the other street architecture/furniture and other street paraphernalia of a typical US city thoroughfare. The bonus to the shot is that it includes a bride-to-be and her bridesmaids waiting their turn on the sidewalk. This is one bride who was determined to break the mold and not turn up late for her own wedding! Donald Trump: Savior or Demagogue?